HomeWho Could That Be at This Hour? I recently read Lemony Snicket’s latest book,Who Could That Be at This Hour?, the first volume in the new All the Wrong Questions series. The writing is kind of standard Lemony Snicket fare–it feels like the author is talking directly to the reader, and there’s quite a bit of sarcasm and understated humor involved. The main character’s voice–in this case, Lemony Snicket himself–is very distinctive and engaging. The story itself also captivates the reader. At its core, it is a mystery, but I must admit that nothing is really solved in this book. In fact, so much remains hidden at the end, that the reader absolutely MUST read the next book, or he/she will remain in a state of confusion for the foreseeable future. 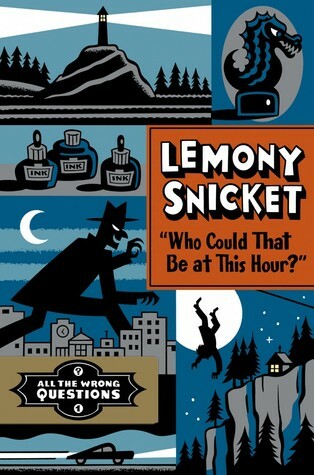 Lemony Snicket’s own past is also a prevalent mystery in this book. Where are his parents? Why is he an apprentice to Theodora? Who–or what–did he leave behind when he ventured on his current quest? What is his end-game? In any case, this book is a mystery wrapped in an enigma, and readers will spend the entire book wondering what in the world is going on. Who is the true owner of the object–a rather unimpressive Bombinating Beast statue–that Lemony and Theodora are trying to recover? Who really hired them in the first place? Well, that may be kind of complicated, and, even though some questions may be answered in this book, they’re probably the wrong ones. Readers will have to stay tuned to learn more about Theodora, Stain’d-by-the-Sea, the Bombinating Beast, and what’s really going on with young Lemony Snicket.